Saturn V Was A NASA Rocket Which Went To The Moon. Saturn V was an expendable rocket used by NASA for the moon missions. 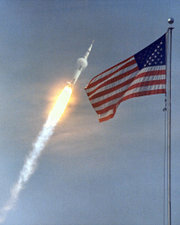 The Saturn V Rocket pronounced 'Saturn Five', was popularly known as the Moon Rocket. Saturn V Rocket was a multistage liquid-fuel expendable rockets used by NASA's Apollo and Skylab programs. The three stages of the Saturn V were developed by various NASA contractors, but following a sequence of mergers and takeovers all of them are now owned by Boeing. Each first and second stage was test fired at the Stennis Space Center located near Bay St. Louis, Mississippi. The facility was later used for the testing and verification of both the Space Shuttle main engine and the newer RS-68 rocket engine currently used on the Delta IV EELV rocket and in the future, on the Ares V rocket. Background to the Saturn V Rocket. By the early 1960s, the Soviet Union had developed a considerable lead in the space race against the United States. In 1957, the Soviets had launched Sputnik 1, the first artificial satellite, and on April 12, 1961, Yuri Gagarin had become the first human to travel into space. On May 25, 1961, President Kennedy announced that America would try to land a man on the Moon by the end of the decade. At that time, the only experience the United States had with manned spaceflight was the 15 minute suborbital Freedom 7 flight of Alan Shepard. No rocket in the world could launch a manned Spacecraft to the Moon in one piece. The Saturn I was in development, but had not yet flown, and due to its small size, it would require several launches to place in orbit all the components of a lunar spacecraft. Development of the Saturn V Rocket. C-1 to C-4. The C-1 was developed into the Saturn I, and the C-2 rocket was dropped early in the design process in favor of the C-3, which was intended to use 2 F-1 engines on its first stage, 4 J-2 engines for its second stage, and an S-IV stage, using six RL-10 engines. On January 10, 1962, NASA announced plans to build the C-5. This would have five F-1 engines on its first stage, five J-2 engines on its second stage and an S-IVB third stage. Originally, the first four flights were to have been tests, first successively testing the three stages, followed by an unmanned circumlunar mission. A manned flight was intended to follow in 1969. In the middle of 1962, NASA decided to use an all-up testing scheme, with all three stages tested at once on the very first launch. This would drastically shorten the testing and development timeline, and reduce the required number of rockets from 25 to 15, but this meant that all the stages would have to work perfectly on the first launch. In 1963, the C-5 was renamed Saturn V, and Rocketdyne produced the first engines. In 1966, the F-1 passed NASA's first article configuration inspection with complete qualification for manned missions coming on September 6. 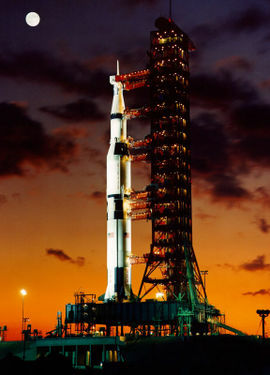 The first Saturn V launch took place on November 9, 1967 with the Apollo 4 unmanned spacecraft as payload. The first manned launch occurred in December 1968, carrying the Apollo 8 circumlunar mission. The Saturn V is arguably one of the most impressive machines in human history. Over 363 feet (110.6 m) high and 33 feet (10 m) in diameter, with a total mass of over three thousand short tons and a Payload capacity of 260,000 pounds (118,000 kg) to LEO, the Saturn V dwarfed and overpowered all other previous rockets which had successfully flown. Comparatively, at 364 feet, the Saturn V is just one foot shorter than St Paul's Cathedral in London. Stages of the Saturn V Rocket. On all but one of its flights, the Saturn V consisted of three stages - the S-IC first stage, S-II second stage and the S-IVB third stage - and the instrument unit. All three stages used Liquid oxygen (LOX) as an oxidizer. The first stage used RP-1 for fuel, while the second and third stages used Liquid hydrogen (LH2). All three stages also used small solid-fuelled ullage motors that helped to separate the stages during the launch, and to ensure that the liquid propellants were in a proper position to be drawn into the pumps. Saturn V Rocket: S-IC first stage. The first stage of Apollo 8 Saturn V being erected in the VAB on February 1, 1968. The S-IC was built by The Boeing Company at the Michoud Assembly Facility, New Orleans, where the Space Shuttle External Tanks are now constructed. As with almost every rocket stage, most of its mass of over two thousand metric tonnes at launch was fuel, in this case RP-1 rocket fuel and liquid oxygen oxidizer. It was 42 meters tall and 10 meters in diameter, and provided 34.02 MN of thrust to get the rocket through the first 61 kilometers of ascent. The five F-1 engines were arranged in a cross pattern. The center engine was fixed, while the four on the outer ring could be hydraulically turned to control the rocket. Saturn V Rocket: S-II second stage. The S-II was built by North American Aviation at Seal Beach, California. Using liquid hydrogen and liquid oxygen, it had five J-2 engines in a similar arrangement to the S-IC. 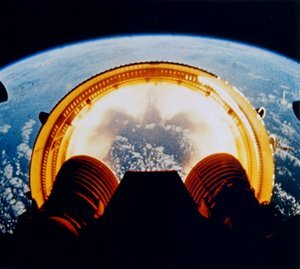 The second stage accelerated the Saturn V through the upper atmosphere with 5 MN of thrust. When loaded, 97% of the weight of the stage was propellant. Instead of having an intertank structure to separate the two fuel tanks as was done in the S-IC, the S-II used a common bulkhead that was constructed from both the top of the LOX tank and bottom of the LH2 tank. 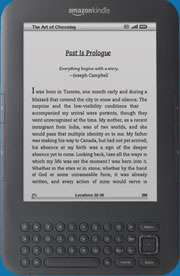 It consisted of two aluminium sheets separated by a honeycomb structure made of phenol. This had to insulate against the 70 ºC (125 ºF) temperature difference between the two tanks. The use of a common bulkhead saved 3.6 metric tons in weight. 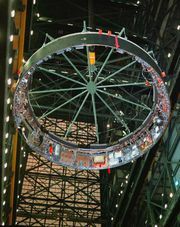 The Instrument Unit for the Apollo 4 Saturn V.
Saturn V Rocket: S-IVB third stage. The S-IVB was built by the Douglas Aircraft Company at Huntington Beach, California. It had one J-2 engine and used the same fuel as the S-II. The S-IVB used a common bulkhead to insulate the two tanks. This stage was used twice during the mission: first for the orbit insertion after second stage cutoff, and later for the trans lunar injection (TLI) burn. Two liquid-fueled auxiliary propulsion system units mounted at the aft end of the stage were used for attitude control during the parking orbit and the trans-lunar phases of the mission. The two APSs were also used as ullage engines to help settle the fuel prior to the translunar injection burn. The S-IVB was the only rocket stage of the Saturn V small enough to be transported by plane, in this case the Super Guppy. Apart from the interstage adapter, this stage is nearly identical to the second stage of the Saturn IB rocket. Saturn V Rocket: Instrument unit. Range safety of the Saturn V Rocket. In the event of an abort requiring the destruction of the rocket, the range safety officer would remotely shut down the engines and after several seconds send another command for the shaped explosive charges attached to the outer surfaces of the rocket to detonate. These would make cuts in fuel and oxidizer tanks to disperse the fuel quickly and to minimize mixing. The pause between these actions would give time for the crew to escape using the Launch Escape Tower or (in the later stages of the flight) the propulsion system of the Service module. The third command ("safe") was used to inactivate irreversibly the self-destruction system after the S-IVB stage achieves the orbit. The system was also inactive as long as the rocket is still on the launch pad. NASA Marshall Spaceflight Center, Skylab Saturn IB Flight Manualc. The F-1 engines of the S-IC first stage dwarf their creator, Wernher von Braun. Saturn V first stage thrust performance during Apollo 15 launch. 7.823 million pounds (34.8 MN) liftoff thrust. The Soviet counterpart of the Saturn V was the N-1 rocket. The Saturn V was taller, heavier, had more liftoff thrust, and greater payload, but the N-1's first stage diameter was larger. The N1 had four test launches before the program was cancelled, each resulting in the vehicle catastrophically failing early in the flight. The first stage of Saturn V used five powerful engines rather than the 30 smaller engines of the N-1, necessary as the Soviets had not developed similarly powerful engines at that time. During two launches, Apollo 6 and Apollo 13, the Saturn V was able to recover from engine loss incidents. The N-1 likewise was designed to compensate for engine failures, but the system never successfully saved a launch from failure. On one occasion it reacted to a fault by shutting down all the first stage engines, destroying the vehicle and its launch pad. Overall, the main reason for the N-1's failures seems to be traceable to lack of all-up testing of the first stage, in turn due to insufficient funding. The three-stage Saturn V had a peak thrust of at least 34.02 MN (SA-510 and subsequent) and a lift capacity of 118,000 kg to LEO. The SA-510 mission (Apollo 15) had a liftoff thrust of 7.823 million pounds (34.8 MN). The SA-513 mission (Skylab) had slightly greater liftoff thrust of 7.891 million pounds (35.1 MN). No other operational launch vehicle has ever surpassed the Saturn V in height, weight, or payload. If the two Russian Energia test launches are counted as operational, it had the same liftoff thrust as SA-513, 35.1 MN. 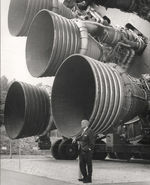 Hypothetical future versions of the Soviet Energia would have been significantly more powerful than the Saturn V, delivering 46 MN of thrust and able to deliver up to 175 metric tonnes to LEO in the "Vulkan" configuration. Planned uprated versions of the Saturn V using F-1A engines would have had about 18% more thrust and 137,250 kg (302,580 lb) payload. NASA contemplated building larger members of the Saturn family, including the Nova, but these were never produced. The Space Shuttle generates a peak thrust of 30.1 MN, and payload capacity to LEO (excl. Shuttle Orbiter itself) is 28,800 kg, which is about 25 percent of the Saturn V's payload. If the Shuttle Orbiter itself is counted as payload, this would be about 112,000 kg (248,000 lbs). An equivalent comparison would be the Saturn V S-IVB third stage total orbital mass on Apollo 15, which was 140,976 kg (310,800 lbs). Saturn V Rocket: S-IC thrust comparisons. The F-1 thrust specification was uprated beginning with Apollo 15 (SA-510) from 1.5 million lbf to 1.522 million lbf, or 7.61 million lbf (31.85 MN) for the S-IC stage. The higher thrust was achieved via a redesign of the injector orifices and a slightly higher propellant mass flow rate. However, comparing the specified number to the actual measured thrust of 7.823 million lbf (34.8 MN) on Apollo 15 shows a significant difference. There is no "bathroom scale" way to directly measure thrust of a rocket in flight. Rather a mathematical calculation is made from combustion chamber pressure, turbopump speed, calculated propellant density and flow rate, nozzle design, and atmospheric conditions. Thrust varies greatly with altitude, even for a non-throttled engine. For example on Apollo 15, the calculated liftoff thrust (based on actual measurements) was about 7.823 million lbf, which increased to 9.18 million lbf at T+135 seconds, just before center engine cutoff (CECO). Thrust specifications are often given as vacuum thrust or sea level thrust, sometimes without qualifying which one. This can lead to incorrect comparisons. 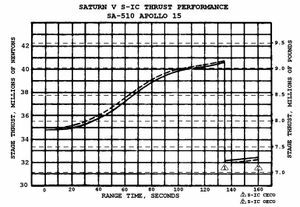 The performance of each Saturn V launch was extensively analyzed and a Launch Evaluation Report produced for each mission, which includes a thrust/time graph for each vehicle stage on each mission. These are available on this page: of the Inside Kennedy Space Center web site. Assembly of the Saturn V Rocket. The Apollo 10 Saturn V during rollout. After the construction of a stage was completed, it was shipped to the Kennedy Space Center. The first two stages were so large that the only way to transport them was by barge. The S-IC constructed in New Orleans was transported down the Mississippi River to the Gulf of Mexico. 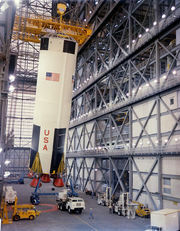 After rounding Florida, it was then transported up the Intra-Coastal Waterway to the Vertical Assembly Building (now called the Vehicle Assembly Building). The S-II was constructed in California and so travelled via the Panama Canal. The third stage and Instrument Unit could be carried by the Aero Spacelines Pregnant Guppy and Super Guppy. NASA decided to use a mobile launch tower, or "crawler", built by Marion Power Shovel of Ohio. This meant that the rocket was constructed on the launch pad in the VAB and then the whole structure was moved out to the launch site by the crawler, which is still used today by the Space Shuttle program. It runs on four double tracked treads, with each 'shoe' weighing 900 kg (2,000 lb). This transporter had to keep the rocket level as it travelled the 3 miles (5 km) to the launch site. Lunar mission launch sequence of the Saturn V Rocket. Saturn V Rocket: S-IC sequence. The first stage burned for 2.5 minutes, lifting the rocket to an altitude of 61 kilometers and a speed of 8600 km/h and burning 2,000,000 kg of propellant. A condensation cloud is seen sticking to the Apollo 11 Saturn V launch vehicle as it works its way up through the dense, lower atmosphere. At 8.9 seconds before launch, the first stage ignition sequence started. The center engine ignited first, followed by opposing outboard pairs at 300-millisecond stagger times to reduce the structural loads on the rocket. The moment that full thrust had been confirmed by the onboard computers, the rocket was 'soft-released' in two stages: first, the hold-down arms released the rocket, and second, as the rocket began to accelerate upwards, it was held back somewhat by tapered metal pins being pulled through holes. The latter lasted for half a second. Once the rocket had lifted off, it could not safely settle back down onto the pad if the engines failed. It took about 12 seconds for the rocket to clear the tower. As it moved past the tower, the rocket yawed away to ensure adequate clearance, in case of adverse winds or engine failures. At an altitude of 130 meters (430 feet) the rocket began to roll and then pitch to the correct azimuth. From launch until 38 seconds after second stage ignition, the Saturn V would fly a preprogrammed pitch program biased for the prevailing winds during the launch month. The four outboard engines also tilted away from the center, so that if one engine had shut down early, the thrust of the remaining engines would have been towards the rocket's center of gravity. The Saturn V quickly accelerated, reaching 500 m/s at 2 km in altitude. Much of the early portion of the flight was spent gaining altitude, with the required velocity coming later. At about 80 seconds, the rocket reached the point of the flight with the maximum dynamic pressure, known as Max Q. The dynamic pressure on a rocket is proportional to the air density around the rocket and the square of the speed. Although the speed is increasing as the rocket gets higher, the air density beyond Max Q is decreasing so rapidly that the dynamic pressure is effectively reduced. At 135.5 seconds, the center engine would shut down to reduce the acceleration loads on the rocket, since it became lighter as fuel was used. The F-1 engine was not throttlable so this was the easiest method. The crew also experienced their greatest acceleration, 4 g (39 m/s²), just before first stage cut off. The other engines continued to burn until either the oxidizer or fuel was depleted as measured by sensors in the suction assemblies. 600 milliseconds after the engine cutoff, the first stage separated with the help of the eight small solid fuel separation motors. This occurred at an altitude of about 62 km. The first stage continued to an altitude of 110 km, then fell in the Atlantic Ocean about 560 km from the launch pad. Saturn V Rocket: S-II sequence. Still from film footage of Apollo 6's interstage falling away (NASA). The second stage had a two-part ignition process, which varied over the duration of the program. In the first part for the first two unmanned launches, eight solid-fuel ullage motors ignited for four seconds to give positive acceleration, followed by the five J-2 engines. For the first seven manned Apollo missions only four ullage motors were used, and they were eliminated completely for the final four launches. In the second part, about 30 seconds after the first stage separated, the aft interstage separated from the second stage. This was a precisely controlled maneuver as the interstage could not be allowed to touch the engines and had a clearance of only one meter. At the same time as the interstage separated, the Launch Escape System was jettisoned. See Apollo abort modes for more information about the various abort modes that could have been used during a launch. About 90 seconds before the second stage cutoff, the center engine shut down to reduce longitudinal pogo oscillations. A pogo suppressor, first flown on Apollo 14, stopped this pogo motion but the center engine was still shut down early. At around this time, the LOX flow rate decreased, changing the mix ratio of the two propellants, ensuring that there would be as little propellant as possible left in the tanks at the end of second stage flight. This was done at a predetermined delta-v. There were five sensors in the bottom of each tank of the S-II. When two of these were uncovered, the Instrument Unit would initiate the staging sequence. One second after the second stage cut off it separated and a tenth of a second later the third stage ignited. Solid fuel retro-rockets mounted on the interstage at the top of the stage fired to help back away the depleted second stage from the remainder of the stack. The S-II impacted about 4200 km from the launch site. 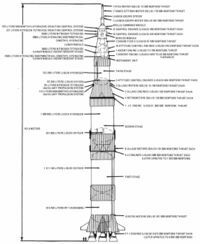 Saturn V Rocket: S-IVB sequence. The S-IVB stage from the Apollo 7 flight in Earth orbit. Although Apollo 7 used a Saturn IB booster, the S-IVB stage was used on both the Saturn IB and Saturn V. On Saturn V flights the four Spacecraft/LM Adapter panels would be jettisoned to allow access to the Lunar Module. If it were to remain on the same trajectory as the spacecraft, the booster could have presented a hazard later in the mission, so the remaining propellant in its tanks was vented out of the engine, changing its trajectory. For third stages from Apollo 13 onwards, controllers directed it to impact the Moon. Seismometers left behind by previous missions detected the impacts, and the information helped map the inside of the Moon. Before that, the stages (except Apollo 9 and Apollo 12) were directed towards a flyby of the Moon that sent them into a solar orbit. Apollo 9's S-IVB was put directly into a solar orbit. Apollo 12's S-IVB stage, on the other hand, had a different fate. On September 3, 2002, Bill Yeung discovered a suspected asteroid which he gave the temporary designation J002E3. It appeared to be in orbit around the Earth, and was soon discovered from spectral analysis to be covered in white titanium dioxide paint, the same paint used for the Saturn V. Mission controllers had planned to send Apollo 12's S-IVB into solar orbit but the burn after separating from the Apollo spacecraft lasted too long, it did not pass close enough to the Moon and ended up in a barely-stable orbit around the Earth and Moon. In 1971 through a series of gravitational perturbations it is thought to have entered in a solar orbit and then returned to orbit the Earth 31 years later. It left Earth orbit in June 2003. In 1968, the Apollo Applications Program was created to look into science missions that could be performed with the surplus Apollo hardware. Much of the planning centered on the idea of a space station, which eventually spawned the Skylab program. 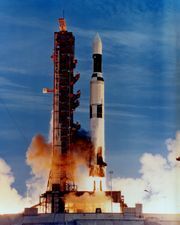 The launch of Skylab (using the Saturn INT-21, a two stage derivative of the Saturn V) was the only Saturn V launch not directly related to the Apollo lunar landing program. Originally it was planned to use a 'wet workshop' concept, with a rocket stage being launched into orbit and outfitted in space, but this was abandoned for the 'dry workshop' concept: An S-IVB stage from a Saturn IB was converted into a space station on the ground and launched on a Saturn V. A backup, constructed from a Saturn V third stage, is now on display at the National Air and Space Museum. Three crews lived aboard Skylab from May 25, 1973 to February 8, 1974, with Skylab remaining in orbit until May 1979. It was originally hoped that Skylab would stay in orbit long enough to be visited by the Space Shuttle during its first few flights. The Shuttle could have raised Skylab's orbit, and allowed it to be used as a base for future space stations. However, the Shuttle didn't fly until 1981 and it is now realized in retrospect that Skylab would have been of little use, as it was not designed to be refurbished and replenished with supplies. The Space Shuttle was initially conceived of as a cargo transport to be used in concert with the Saturn V, even to the point that a "Saturn Shuttle," using the current orbiter and external tank, but with the tank mounted on a modified, fly-back version of the S-IC, would be used to power the Shuttle during the first two minutes of flight, after which the S-IC would be jettisoned (which will then fly back to KSC for refurbishment) and the Space Shuttle Main Engines would then fire and place the orbiter into orbit. The Shuttle would handle Space station logistics, while Saturn V would launch components. Lack of a second Saturn V production run killed this plan and has left the United States without a heavy-lift booster. 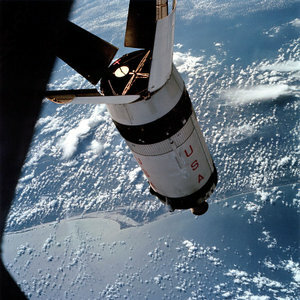 Some in the U.S. space community have come to lament this situation, as continued production would have allowed the International Space Station, using a Skylab or Mir configuration with both U.S. and Russian docking ports, to have been lifted with just a handful of launches, with the "Saturn Shuttle" concept possibly elmininating the conditions that caused the Challenger Disaster in 1986. The Saturn V would have been the prime launch vehicle for the cancelled Voyager Mars probes, and was to have been the launch vehicle for the nuclear rocket stage RIFT test program and the later NERVA. Successors to the Saturn V Rocket. As of 2006, NASA plans to build the heavy-lift Ares V, a Shuttle Derived Launch Vehicle approximately the same height and weight class of the Saturn V. The launcher has been named as a homage to the Saturn V. It is intended as an unmanned heavy lift vehicle for future manned missions to the moon and possibly later Mars. Unlike the 3-stage Saturn V, the two stage Ares V features a 33-foot diameter core stage (the same diameter as both the S-IC and S-II stages) fueled with liquid hydrogen and liquid oxygen and assisted during the first two minutes of powered flight by a pair of modified Space Shuttle Solid Rocket Boosters which will have five segments in place of the current four. The core stage will be powered by five RS-68 rocket engines in the same cross pattern as that used on the S-IC and S-II stages. Originally the Ares V was to have used five Space Shuttle Main Engines, but the switch to the RS-68 was based on both costs, and its successful flight use on the unmanned Delta IV EELV launch system, along with being more powerful and easier to construct than its SSME counterpart. The RS-68 engines, built by the Rocketdyne Division of Pratt and Whitney (formerly under the ownerships of Boeing and Rockwell International) are more efficient than the Saturn V's F-1 engines, but the J-2 engine used on the S-II and S-IVB will be modified into the improved J-2X engine for use on the Earth Departure Stage (EDS), a beefed-up version of the S-IVB on the Ares V, and on the second stage of the proposed Ares I. Both the EDS and the Ares I second stage would use a single J-2X motor, although the EDS was originally designed to use two motors until the redesign employing the five RS-68s in place of the five SSMEs. Cost of the Saturn V Rocket. From 1964 until 1973, a total of US $6.5 billion was appropriated for the Saturn V, with the maximum being in 1966 with US $1.2 billion. One of the main reasons for the cancellation of the Apollo program was the cost. In 1966, NASA received its highest budget of US $4.5 billion, about 0.5% of the GDP of the United States at that time. In the same year, the Department of Defense received $63.5 billion, about 7.0% of GDP. Saturn V vehicles and launches. 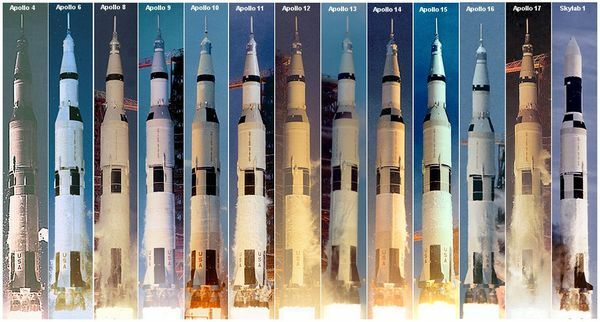 The Saturn V launched day or night, in foul weather or fair, at the appropriate time to reach its destination, as shown in this montage of all launches. SA-508 Apollo 13 April 11, 1970 Mission aborted, crew saved. A Saturn V on display at the U.S. Space & Rocket Center in Huntsville, Alabama. At the U.S. Space & Rocket Center, made up of S-IC-D, S-II-F/D and S-IVB-D (all test stages not meant for actual flight)(soon to be moved to a new visitor's center). Of these three, only the one at the Johnson Space Center consists entirely of stages meant to be launched. The U.S. Space & Rocket Center in Huntsville also has on display an erect full scale model of the Saturn V. The first stage from SA-515 resides at the Michoud Assembly Facility, New Orleans, Louisiana and the third stage was converted for use as backup Skylab. Backup Skylab is now on display at the National Air and Space Museum. The blueprints or other plans for the Saturn V still exist on microfilm at the Marshall Space Flight Center.